Chairside Economical Restorations of Esthetic Ceramic (CEREC®) has pioneered dental procedures. CEREC® uses a computer-assisted design (CAD) tool and a milling machine that gives our Charlottesville dentists the ability to create custom made ceramic dental restorations a much shorter time than traditionally possible. The conventional crown procedure consisted of the tooth preparation, messy impression materials, and fabrication of a temporary crown for the patient. Then, the impression had to be sent away to the lab and the patient waited 3-4 weeks for the crown to be fabricated. Once the crown is fabricated, the patient returns, having to be anesthetized again, and the crown is finally cemented. With CEREC® technology, a digital impression means no messy impression material. In many cases, the crown is made while you wait, so you leave the office with your permanent crown! This saves you time, an extra trip to the dentist, removes weeks of waiting and prevents having to careful treat and eat with a temporary crown. How does the CEREC procedure work? Once you arrive at Downtown Dental, the area will be numbed and your dentist will carefully prepare the tooth to specific dimensions for your new crown. Using a high-quality camera, the dentist acquires video of the tooth. A medical grade computer processes this information in order to make a 3-D model of your mouth. Your trained dentist is then able to rotate and enlarge your tooth model to design a crown that is a perfect fit for your tooth. Once the dentist has designed your beautiful custom crown, a special milling unit will cut your crown out of a compressed porcelain block, which provides additional strength compared to hand stacked porcelain from the laboratory. This process only takes around 15 minutes. The crown is now ready to be tried in your mouth for fit and any adjustments made. The dentist may then add some custom coloring and glaze to the tooth before firing it in a special oven to achieve maximum strength. Your final crown will then be cemented before you leave. Ask your Charlottesville dentist if CEREC is an option for you! Some exceptions apply. If you have a deep bite or have a history of breaking these types of devices, you should speak to your dentist because these products may not be the best option for you. Downtown Dental will always work to find the best solution for your unique situation! How long do CEREC® dental restorations last? We know that CEREC® devices last for over five years. 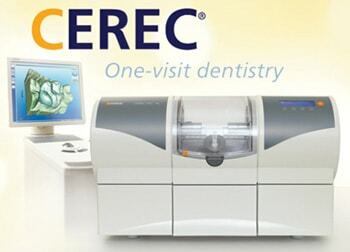 Now, research shows that most CEREC®-created dental restorations may last for 10 years or more. Your Charlottesville dentist can provide additional information and answer any questions you have regarding CEREC®.